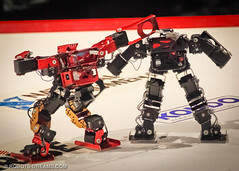 Robo-One is the biggest humanoid robotics competition in the world, typically held twice per year. The last competition was held earlier this month; see the results in our earlier post. If you have a custom (Level 6) humanoid robot, this is the place to be — book those tickets now! If you don’t have a custom humanoid, but you have some standard kit (Level 3 or below), you can still compete in the newer “Robo-One Light” competition. A list of approved bots, with handy pictures, is provided here. It looks like you generally have to stick to the stock kit, with the possible exception of control scheme (they have to make sure all the bots can play in the same space without interference). So this competition will come down mainly to the quality of your custom motions, and your skill as a controller. It’s a great way for a beginner robot hobbyist to get into the competition, meet other builders, and get fired up for the next challenge.